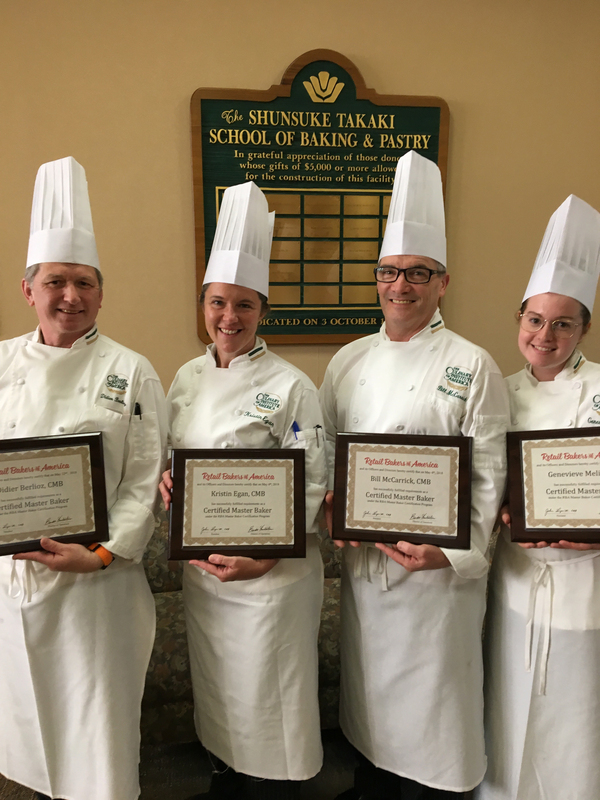 Hyde Park, NY – Four faculty members at The Culinary Institute of America recently passed a two-day exam to earn the designation of Certified Master Baker (CMB). The respected credential is the highest that can be achieved through the Retail Bakers of America trade association. The CMB designation is a sign that baking and pastry professionals have reached the pinnacle of their profession. The new CMBs are all lecturing instructors in the School of Baking and Pastry at the CIA’s New York campus: Didier Berlioz, Kristin Egan, Bill McCarrick, and Genevieve Meli. The test covered many categories of baked goods, including several kinds of breads and Danish, cake baking and decorating, as well as an “open” category allowing the chefs to show off their skills and creativity. There were also two surprise items they had to make: sunflower seed bread and an individual pastry. The chefs were judged on both the quality of the items they made and on their ability to produce consistent results in large quantities. The certification test was held on the CIA campus and many students stopped by to watch their teachers and cheer them on. “The students gave us all incredible energy by their support during the exam—clearly a change of roles,” Chef McCarrick says. The college’s three U.S. campuses now boast a total of 18 CMBs.